What if that empty milk jug you just tossed into the recycling bin could be made into a fun toy for your kids to play with? Now it can, thanks to an amazing toy company called Green Toys Inc. This amazing toy company out of California creates cute and colorful children’s toys from recycled plastic milk jugs. creating toys that really are green in so many ways. We believe the world would be a much better place if everyone said “please” and “thank you”, cell phones didn’t ring during movies, and all toys were fun, safe, and made from environmentally friendly materials. Since it’s probably no use holding our breath for those first two, we’re concentrating on the toys. Green Toys Inc strives to be eco-friendly from start to finish. First their toys are made from recycled milk jugs and other environmentally friendly materials. Second, everything is local to their business in California. 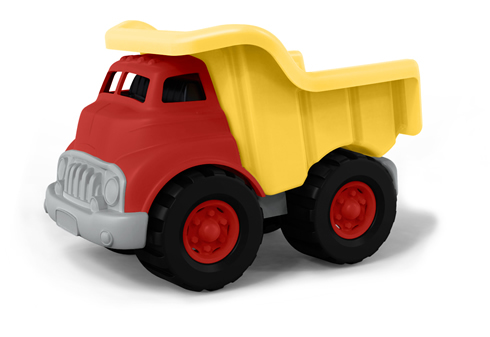 They are made 100% in the USA, reducing the fuel and energy use that transporting the toys or materials would use. And as they mention on their site the toys are made in California, a state known for strict toy safety and environmental laws. Even their packaging is recycled and environmentally friendly! They contain no traceable amounts of Phthalates or BPA. They are also designed without any external coatings, eliminating the fear of lead paint. With the fears of toys today being dangerous it is more than a little reassuring to know that Green Toys Inc takes so much effort to keep their toys safe for kids. Especially with the recent CPSIA issues that may remove many people’s safe options for toys made by independent toy makers here in the US. Green Toys inc offers a handy store locator that you can use to find stores near you that sell their toys. There is also a list of online shops, such as Ambitious Green, both in Canada and the US where you can order them online. Awesome! Love this closing the loop thing. Love finding new sources for safe and healthy toys. I have two little girls and ten nieces and nephews, so we end up purchasing a fair number of toys each year. Hey, Scott from Ambitious Green! We love Green Toys and we really like the Tea Sets, Dining Set and the Gardening Kit that Lee mentioned above. Also, we’ve seen the new releases for 2009 they’re beautiful — so you’ll be seeing those over at Ambitious Green very soon. Green Toys is special because they “get it” — stylish, educational products that solve a real need both in toy quality, benefits and environmental impact. We’ve got more Green Toys coming in shortly. And don’t hesitate to drop me a line! I love it. The idea of ordinary kitchen garbage being turned into toys is fantastic. Love your bog. We have some of these toys already and I’m excited to see that they have more boy toys to choose from. Our favorite place to buy is http://www.limeblossomnaturals.com. They have great organic products. So many great ideas and possibilities! Reduce,reuse,recycle and go green every chance you get, even when buying toys for your children. Nice blog! This also helps kids by showing them something they care about can be recycled, and their reactions are amazing. They really love it, coming from a 2nd grade school teacher. We love the Green Toys brand at our website, http://www.franklingoose.com/merchants/Green-Toys-Inc. They make such wonderful toys, and we also love their utensils and plates! For Green Toys and other natural toys, please visit Franklin Goose! Check out the fair trade wooden toy train set at http://planetonegifts.com/wooden-train-set.html. On sale now at 50% off. Also available is an airplane, bulldozer and car. Wonderful gifts for children to enjoy for years to come. I love the idea of green toys! They’re safe for our kids and great for the environment. Mauka Woodwerks of Ft. Collins, CO is a “Green” Eco company making unique handcrafted upcycled wood toys that are very “old school” well designed, built, and very fairly priced. We are small, family owned and doing our best to offer an alternative to the “big box” plastic toys. We also offer eco artistic products for the home and garden.